On a rainy morning Björn Bredström found me seated comfortably on the front porch of the Guest House at Ålgården Workshop making a drawing. He said, “You haven’t gone very far…” That comment gave me the name for my installation. The drawings I have used in preparing an eight meter band of imagery for the interior of Ålgarden’s “pump house” were all made in the immediate environment of the art center. The “pump house,” is a delightful, curious, small round 19th century building about 3 and a half meters in diameter inside. The outside of the building is brick, but the inside is old, off white plaster. A puffy, to my eye Russian looking, metal dome tops the building. It is supported inside by two sets of heavy wooden beams. Small windows let light down between the beams creating x shaped shadows. My imagery is presented through the medium of experimental photocopy. The way I work with photocopying no two prints are identical. Usually I place my drawings, which have been made on transparent plastic, down first against the copier’s glass, then I layer different kinds of materials over them. I use slightly rumpled paper for the “lid.” Where light creeps in the image is darkened. Some of the lines in my drawing will “fog”. I’ve learned to control somewhat areas of focus and blur, and dark and light, but much is left to chance. I make a lot of copies, then choose what I find is most expressive. In Ålgården’s pump house I have placed colored sheets of plastic over some of the window panes in the drum of the dome. The light inside the pump house makes the white of my black and white prints look slightly blue violet. Where strong sunlight enters through the colored panes, orange, green and light blue will play over parts of my imagery. I like the idea of letting changing light be part of the piece. 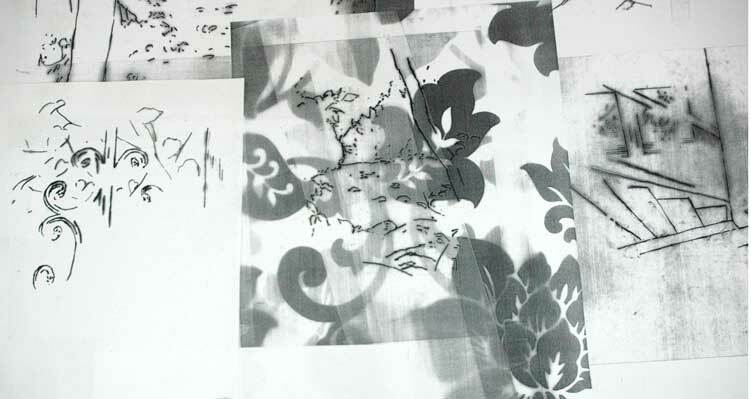 I have worked with photocopy as an art medium for a number of years. My interest in the medium led me to a four month residency at Xerox PARC- Palo Alto Research Center in California in 2001 and three weeks as a guest artist at MIDE, Museo Internacional de Electrografía in Cuenca, Spain in 2005. A residency is for me a special opportunity to concentrate on my artwork. I am a Professor of Art in the Department of Art and Design at the University of Idaho in the United States. Usually during the academic year I teach drawing and printmaking. This semester I am on leave. University of Idaho awarded me a grant to cover the cost of my airfare to Sweden and other expenses associated with my work at Ålgården.